In knowledge industries like engineering and finance, debates rage on endlessly about “best practices”. Should you do pair programming, or rely on thorough code review? Is market research valuable, or should companies exclusively do A/B testing? Will bilingual education improve overall student performance, or is it a waste of time? Ask any expert who does not have a conflict of interest – i.e. they’re not selling their own “system” – and they’ll eventually admit that these best practices aren’t nearly as important as the people on your team. Process can help at the margins; for example, I’d probably be nervous flying with any pilot who didn’t use a pre-flight checklist. However, given the choice between a pilot without a checklist and a pilot who does not know the definition of altitude, I’ll pick the former every time, no matter how much training the second guy supposedly has. There has been much hand-wringing of late by social activists desperate to salvage the “blank slate” theory that literally everything is socially constructed, and with the right education and environment (and rules – lots of rules!) we can prepare anyone for any kind of work. They then push insane solutions, making the bizarre claim that adding more non-whites racial diversity and women gender diversity will improve performance, apparently oblivious to the inherent contradiction. The reality is as brutal as it is obvious: individual IQ determines group IQ. All prior “studies” that claim otherwise have failed to control for individual IQ. You can’t fix stupid. Aside: All of the above refers to g-loaded tasks (AKA “knowledge work”). g is the symbol for general intelligence, and IQ is an indirect but highly accurate measurement of g in terms of how well it predicts performance on a wide range of cognitive tasks. Given our knowledge that females cluster more tightly around the mean, there is in fact a real scenario where hiring as many women as possible is the optimal choice: jobs that are moderately g-loaded, where the avoidance of low-g employees is more important than the recruitment of high-g employees. Consciously or unconsciously, society knows this, which is why women dominate the service sector. Average is good when it comes to social interaction and tasks that are mostly repetitive with a small degree of improvisation. I’m not mad that men are over-represented in prison, and women shouldn’t be mad that men are over-represented in STEM; in both cases, we’re dealing with people at the extreme end of the g-curve. The correlation is near-perfect aside from some anomalous results in China, which I’ll get to in a moment. It’s actually astonishing how, despite the massive cultural, economic and political differences between the USA, Argentina, Russia, Australia, and the various European nations, they have all done pretty well. It seems that a nation built on petty criminals can thrive if they are smart criminals, and once-great nations will eventually bounce back even after decades of oppression by mass-murdering Communist dictators. Governance is a heavily g-loaded task; highly-intelligent groups have inherent capacity for self-governance and will naturally organize themselves into some sort of hierarchy (the specifics of which are culturally-dependent), whereas low-IQ groups will govern like children, subject to laziness, paranoia, and tribal violence. Some may be tempted to cry cultural bias or assert that the causative effect is backwards – that high development leads to high IQ, not the other way around. These things are not mutually exclusive, and causation can actually go both ways in a virtuous cycle. At least, that seems to be the only explanation why average IQ for a race residing in the USA or Canada is about 10-20 points higher than the exact same race elsewhere in the world; Ashkenazi Jews average 110-115 in the USA but only about 100 in Israel, and Africans average around 85 in the USA vs. 70-75 in Africa. It’s hard to pinpoint the exact cause of this, as it still seems to be a taboo subject for researchers, but I will use some logical inference to make an educated guess that the mystery ingredient is liberty. The combination of libertarian economics and traditional marriage (monogamous, but not arranged) are inherently eugenic. Societies that uphold these values also embrace the inverted-pyramid model of human development – the reality that phenomena like Moore’s Law require continued breakthroughs in scientific, mathematical, technological and business (entrepreneurship) fields, and that these breakthroughs are the result of exceptionally-talented individuals. 100 average scientists will ultimately contribute less than a single Newton or Einstein. These individuals create entirely new branches of science and industry. The trouble is, we can’t simply make more Einsteins or even identify them in advance. The best system we have at present is one that supports free inquiry by as many smart individuals as possible (libertarian), and also tries to make as many new smart people as possible by implicitly linking material success (which correlates highly with intelligence) with genetic success and providing stable two-parent homes. If a better system exists, no one has found it yet. By contrast, Marxist/Leninist systems are inherently dysgenic. From a purely economic point of view, if you subsidize low intelligence, you’ll get more of it. Restricting free association and free speech makes scientific inquiry very difficult, so the most talented people will flee on principle alone. Once the economic downturn of late-stage Communism hits, the marginally-talented people will start to flee for economic reasons. Any talented people who remain will tend to be persecuted (c.f. the Kulaks, or more recently, Venezuelan bakers) if not killed outright. As the saying goes, collectivism is always one execution away from utopia. It is through this ruthless suppression of individual success – and by consequence, individual intelligence – that entire societies can not only halt economic and scientific progress but also wipe out their entire gifted-to-genius population for several generations. Which brings us back to China. They don’t have Chairman Mao anymore, and have moved from pure Communism to a strange mixed economic model, but compared to Russia, they took a very long time to recover. This explanation for their comparatively slower development is corroborated by U.S. census data, which shows that Asians (predominantly Chinese) in America are more successful than Caucasians by a wide margin. Ethnic IQ would predict this outcome on a local level, but it also rules out the possibility that ethnic Chinese have some other genetic disadvantage that cancels out their higher IQ. In other words, the problem is China itself, not the Chinese people. And it’s surely not geography, because China has plenty of arable land and access to waterways. It’s the Chinese government and national culture. That is gradually changing, and if those changes continue, they will catch up to the west. Technology is getting smarter and will continue to replace low-g tasks with automation. It’s more important than ever that we find some new breakthroughs and create new industries, and that means pumping out as many geniuses and entrepreneurs as possible while maximizing their opportunities for success. That’s going to require significant changes to the way we think. If we want to come out of this century alive, we can’t afford to make sympathy our first priority. For those of us still living in an “average” (>= 100) IQ society, our first priority must be keeping western society above the breaking point of IQ 97, which means severe restrictions on immigration and a permanent end to the welfare state. Our second priority should be throwing every available resource at finding a reliable and repeatable way to raise the average IQ by even a tiny amount, and exporting it across the globe. We can’t be greedy here; boosting global IQ by even a few points will dramatically lower global conflict and bring many new research partners to the table for the third priority: finding some way, whether biological or technological, of massively raising general intelligence. Most of the world needs at least a 10-point gain, and if we want to fix the problems in Africa, we need a 30-point gain. Ignoring or denying the reality is civilizational suicide. Whether by war, invasion, civil strife, or plain old overpopulation, western society is vulnerable. This is more important than climate change, and it’s damn well more important than manspreading. We have the knowledge, talent, and technology in the west to make real progress on this issue, without cruelty or violence, if we could only break through the social taboos and get serious about it. Our future depends on it. Remember when the National Review offered high-quality writing and analysis and a great alternative to the mainstream media? Those days are officially over. Urban and academic progressive leaders can respond to violence with all the scolding tweets, sternly worded statements, and calls for calm they want. But until those who break the law and violate university policies are aggressively brought to justice, it won’t matter. To summarize: For a solid 6 months, the American left has been refusing to accept or even acknowledge the results of the 2016 national election. They’ve been destroying property in the capital, planning acid bombs at conservative events, busing paid protestors to heckle town halls, beating up every Trump supporter they can find, sucker-punching anyone they can manage to associate with the dreaded “alt-right” and then bragging about it on social media, all while the university faculty clearly side with the Bolsheviks or even join them, and the police are visibly standing down. The National Review has apparently just now realized that the left has gone feral, and their response is to politely demand that the authorities step in. Unfortunately, this seems to be what mainstream conservatism has become. It’s a literal mirror image of the intellectually lazy limousine liberal solution to every social ill: Point at it, clutch pearls, shriek “somebody should do something!” then move on, secure in the knowledge that it is Somebody Else’s Problem. At the National Review, we’re always just one step away from the edge of the cliff but somehow never fall and can always easily turn back. Meanwhile, out in the real world, the right wing has been predicting this ever since Hillary’s “we go high” speech, and the emergence of characters like Based Stickman merely reflect a decision to start fighting back. Even many classical liberals have figured it out by now: we’re not “risking” a civil war, the war has already started, and the evidence is literally staring us in the face. The black blocs aren’t going to just calm down, crawl back into their dorm rooms and transfer from White Privilege Theory into Applied Mathematics. They are going to keep escalating until either they get everything they want or they are physically incapacitated. Weimerica isn’t just some weird neoreactionary meme anymore, it’s officially arrived at Berkeley and probably coming to a campus near you. Clearly, he knows who the real instigators are, but like a good little housebroken fakeservative, he wraps it up in layer after layer of obfuscation, making sure to differentiate himself from those dastardly “neo-Nazis” whom we keep hearing about but no one can actually seem to find. Grow a backbone – not by fighting back, of course, but by taking to social media and shaming the thugs who kicked your face in. Everything will sort itself out, if you just cower in the corner and pray for the Rule of Law to return. The National Review has been going downhill for a long time, but if they can’t even take a firm stand in the face of bona fide domestic terrorism, then they have crossed the final bridge into total irrelevance. It’s a good thing that the Old Right is a dying breed. With friends like this, who needs enemies? In response to what may or may not have been a chemical weapons attack in Syria, President Trump flung some missiles at a Syrian airbase, a move which was explicitly labeled as a “one-off” and did hardly any real damage. Those who have followed American foreign policy since before 2016 are probably aware that these missile strikes are largely symbolic; that is, they’re intended as threats of war, not acts of war. It may sound cold and callous when there are actual human casualties involved, but considering that in ancient times warlords would burn down entire villages as a “warning”, I prefer the modern version. The globalist leaders and neocons were, of course, thrilled at the news. The alt-right is literally shaking. Moderate and socialistic liberals, who are the majority demographic around me, are a mix of nonplussed, mildly skeptical or mildly supportive. Don’t believe any nonsense put out by Salon or HuffPo; the majority of the normie community is – arguably, for the first time since the election – debating a Trump decision as a legitimate policy issue, rather than the insane ramblings of Literally Hitler. That’s worth discussing on its own, but my focus today is how the mainstream right-wing media is desperately searching for someone on whom to pin the blame, and they’ve got J-Vanka firmly in their crosshairs. Even the leftstream media is joining in the festivities. It’s provably true that Ivanka and Jared are New York Democrats; she couldn’t change her registration before the election. In various interviews, Ivanka comes across as intelligent, but not totally authentic, which seems par for the course in celeb-land, although I would not say the same thing about Jared at all. Watch any video of him speaking and it’s obvious from his words, facial expressions and body language that he not only isn’t faking it but also doesn’t particularly enjoy being in the spotlight. Regardless of what you believe about his ideology or his goals – and there is every reason to be skeptical of anyone we know so little about – it’s quite possible that he is the only straight-talker in Trump’s inner circle other than Steve Bannon, which might explain why some others on the Trump train don’t believe the drama llama. The narrative being pushed now is that the God-Emperor, after all of the cut-throat political games and media hit-jobs he’s been subjected to, suddenly lost his mind and decided to derail his entire platform because Ivanka made a pouty face. This narrative doesn’t stand up to even the slightest bit of scrutiny, and reeks of the same “mentally unstable” narrative that the Clinton campaign broadcast via sympathetic media. The Donald is a former reality-TV star and understands kayfabe; from a realpolitik point of view, it’s in his interest to pretend to be a little bit crazy, so as to intimidate enemies and generate media buzz. Unfortunately, the “fact” of his newfound gullibility is now being used by the right-wing media as a vehicle to assign blame, push ridiculous conspiracy theories, and sling any mud they can at these two nefarious outsiders, who, as pundits continue to remind us, are New York Democrats whom we didn’t vote for. Never mind the fact that The Donald was once a New York Democrat, or that we didn’t vote for people like H.R. McMaster or Stephen Miller either. Never mind that the most outspoken opponent of Syrian interventionism is a Democrat. It’s impossible that people like Jared or Ivanka might be motivated by loyalty to the Don, or simply a desire to excel at the work they do. They’re clearly rogue agents, because reasons. BE ANGRY! As a public service, allow me to offer an alternative J-Vanka narrative that is not completely retarded. I cannot prove any of this, nor can anyone else prove their version. It is another plausible explanation that fits the facts, or as Scott Adams might say, another movie playing on the same screen. It’s simply this: Donald Trump is applying realpolitik, AKA power politics or Machiavellian politics. The dominant influences in society today all follow the Alinsky model. Although postmodernists and Cultural Marxists don’t have any real authority, they are able to effect huge political and social changes by controlling the narrative (media and education) and subsequently using that to attain positions of influence in other areas, such as Big Tech. This has been going on since at least the second world war, but it’s only recently that broader society has been waking up to it. Pundits across the political spectrum have been keen to point out that the Trumpening is a reaction to the ascendance of SJWs and their authoritarian far-left identity politics, but don’t often stop to consider what this means, or arrive at oversimplified explanations such as “whitelash”. These aren’t entirely off the mark, but by laser-focusing on demographics, they ignore the political system itself. Rules for Radicals was written as a counterbalance to The Prince (Machiavelli). Alinsky and his disciples arrogantly described the Rules as a method to take power [back] from the powerful, but in reality it is simply a recipe for petulant children to extract handouts and other concessions from the powerful. If you believe, as I believe, that the USA is no longer a true representative democracy nor a true free market, but rather a corporatist oligarchy (bordering on principate) colluding with a few large corporate oligopolies (military-industrial-intelligence, media-academic, tech-infrastructure, etc.) then these rules work exceptionally well because of the concentration of high-value targets. However, the other reason the Rules have been so effective is because, until recently, the political right had naïvely given up on realpolitik, apparently in the insane hope that the government bureaucracy – the Deep State, if you will – would voluntarily shrink itself. I don’t know how serious President Trump is about shrinking the bureaucracy. He pushes hard in some areas, like the EPA, but he’s also been handling the elephant in the room with kid gloves. One thing I am sure of, though, is that he wants to re-establish American dominance and American exceptionalism, and he knows a thing or two about dirty fighting, hence his tough stance on immigration. Removing the Alinskyites from public influence will require the use of power politics. To be effective in this, President Trump needs, first and foremost, a loyal inner circle – but not yes-men, empty suits, or timid bureaucrats. He needs people who bring physical, economic, and intellectual firepower to the table, and who aren’t afraid to use it. These are his “generals”, and by necessity, some of them will be unsavory characters. Steve Bannon and Stephen Miller are offensive to the left; Steven Mnuchin and Jared Kushner are offensive to the right. These choices may seem to be chaotic or even self-destructive when viewed through an ideological lens. However, they make perfect sense when viewed through a realpolitik lens. Nikki Haley, for example, is a nutty neocon, so Trump put her in a bully-pulpit position at the UN where she could rant and rave and please the foreign policy hawks without doing any real damage. If Politico is to be believed, Kushner may be able to find common ground between America and Russia on Israel, which has historically been virtually impossible and might explain why Russia has suddenly and inexplicably decided to recognize West Jerusalem as the capital of Israel. However, there is more to the specific case of J-Vanka’s influence, and it is brilliantly summed up in one of CGP Grey’s Rules for Rulers videos: No man rules alone, and no man rules forever. In a de facto oligarchy, the succession question matters. If The Donald wants his sons to inherit his business empire, he needs another potential successor on the political front. In a hypothetical future political campaign, Ivanka would be poised to get the female vote and the Jewish/Zionist influence machine; if she could manage not to piss off the white male voters at the same time, it would be an even bigger landslide than the God Emperor himself. Her election prospects are solid, she doesn’t mind the spotlight, and Jared himself would be the campaign’s engine. Again, I’m not talking ideology here, just politics. Is Ivanka’s true nature a typical fuzzy-headed, feminist-sympathizing, liberal New York Democrat? Or is she just playing that up in order to gain popularity? I don’t know and neither does anyone else, but I have a hard time believing that her Dad has had zero influence on her values. That would be a major criticism of Donald and Melania’s parenting skills, and judging by their sons, it’s a stretch. President Trump either earnestly believes that Ivanka will someday be able to carry on where he leaves off, or believes that other politicians and special interests believe it, which is good enough to seal the deal and convince them that supporting him is worth the very real economic and physical risks. I don’t like the idea of a Trump dynasty any more than I like the idea of a Clinton, Bush, Roosevelt, or Kennedy dynasty, but there is simply no denying the powerful and lasting influence that these dynasties have had on American politics. Even as I write this, Chelsea Clinton is being groomed for an eventual political career, Jeb Bush may try to make a comeback, and if not, then his son George Prescott has already started his political career. Let’s look at the possible upside: What would it mean to have a dynasty that is fiercely nationalistic and opposed to the neoconservative/neoliberal establishment? Do we hate dynasties because dynasties are inherently bad, or have we simply been disillusioned by a slew of awful presidential dynasties? In my movie, J-vanka are not Trump’s enemies; they are his literal lifeline. Any serious drama between them and Bannon is exaggerated or not real at all, played up like a pro-wrestling match for the excitable corporate tabloid media to keep them satiated with clickbait headlines and distracted from serious policy issues. I don’t know if my movie is the right one, but unlike the other movies in the political theater, it maintains continuity with the prequels. UA overbooks a flight. Standard practice, usually no problem because passengers don’t show up. The flight ends up being completely full. At this point, all passengers have already boarded. Some low-level UA employees decide they belong on the plane, and some passengers who have already boarded will need to get off. They offer a $400 pittance for people to give up their seats. No takers. They offer an $800 voucher (negotiating lesson: always reject the first offer). Still no takers. Apparently – and this may surprise you – people traveling on business or who booked their vacations months in advance, spent 2+ hours at the airport and followed all of United’s draconian rules, are not too keen on giving up their professional and social lives in order to help some needy guitar exterminators. They then announce that they will randomly boot 4 passengers off the plane. The first 3 comply. The 4th, an Asian man, says he is a doctor who needs to get back to his patients and refuses to leave. United staff decide that it is not worth the trouble and leave the man to enjoy a peaceful flight. Hahahaha, of course they don’t do that. Instead, the doctor is dragged literally kicking and screaming out of his seat, and his face is smashed and bloodied on an armrest on the way out. United makes a public statement indicating that they give zero fucks because the man was being “uncooperative” with their attempt to kick him off the flight for no reason at all. United’s CEO, who just a few weeks earlier had been named Communicator of the Year, weighed in with another non-apology for “re-accommodating” the man whom they beat up. This is the kind of PR disaster that should, in a just world, sink a company, or at least give them a good spanking in the stock market. What actually happened was: crickets, because every single trader out there worth his salt knows that all US air travel is owned by just 4 companies. You basically can’t lose with these guys, and any sudden dip is just an opportunity to increase your holdings. Unlike Starbucks, you can’t really hurt United’s brand, because their brand is already worthless; expectations of shareholder returns are based on sheer necessity, not brand perception. It’s astounding. Delta alone seems to have congealed from over 15 distinct airlines at various times. Oligopolies are to monopolies what oligarchies are to monarchies. Having more than one player on the field doesn’t mean they’re on different teams, and certainly doesn’t mean they’re playing to win. Oligopolies stifle innovation, and while some kooks blame “deregulation” for what happened to the airline industry, the truth is that air travel is massively regulated, including for example pages upon pages dedicated to how non-pilots need to be certified. If detailed requirements for carry-on tubas are “deregulation”, you don’t want to know what the “regulated” version looks like. Theories on the sector’s slow decline no doubt abound, as they do with health care, college, and so on. From a macroeconomic point of view, however, it looks like just another casualty of neoliberal corporatism. For example, the airline industry received a massive bailout in 2001 – around the same time that the final wave of consolidation began and new players stopped appearing. But that’s small potatoes compared to the $155 billion in subsidies that carriers received prior to the bailout. 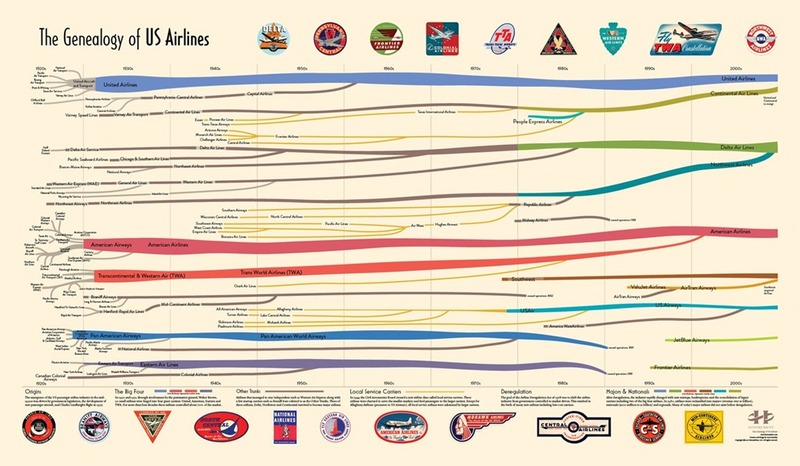 Just as TARP gutted the small banks and credit unions by giving the Wall Street cartel an unfair advantage, the massive airline subsidies very likely gave airlines like United, Pan-Am and TWA unfair advantages over the smaller upstarts, which they then used to crush and subsequently buy out those upstarts. Those that they couldn’t buy, they regulated (via the feds) into oblivion. I am speculating, of course, but industry transparency is so pathetically low that I don’t think we can ever know for certain. Correlation is not causation, but it’s hard not to notice the clear historical correlation between regulation, subsidies, and monopolization. Now let’s all sit back and enjoy the quality services of United Airlines, United Health, Comcast, Viacom, and Verizon.